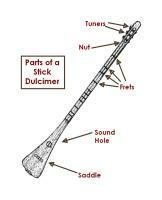 The dulcimer's appeal derives from being easy to learn and play. Here are some resources for starting out. Strum a song with just one finger on the bottom string. Play familiar tunes without reading music. Play guitar-style chords from simple diagrams.